Microsoft has revealed the pre-order bonuses available for dedicated fans of the company's high-definition rehash of the original Halo. The awkwardly titled Halo: Combat Evolved Anniversary is scheduled to hit store shelves on November 15, 2011. 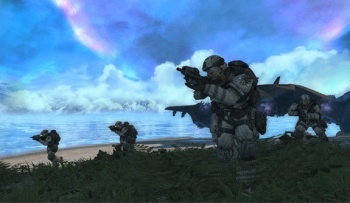 It is a high-definition remake of the first title in the mega-successful Halo series, and marks the game's tenth birthday. Earlier today, Microsoft announced a host of bonuses to be bestowed on those gamers who pre-order the title. Specifically, a set of Mjolnir armor for your Xbox Live avatar, and an in-game item that makes your foes' deaths a bit more bombastic. Master Chief Avatar Armor -- Heroes Never Die, and to honor the 10th anniversary of John 117, you will finally be able to transform your Xbox LIVE Avatar into the iconic hero by outfitting it with Master Chief's signature MJOLNIR Powered Assault Armor. "Grunt Funeral" Skull -- An exclusive, game-modifying skull that changes the rules of the game for an explosively humorous experience, "Grunt Funeral" sends Halo's most lowly and lovable enemy out in a blaze of glory. And plasma. And then more glory. Once the skull has been activated, every Grunt's methane tank will explode like a plasma grenade when killed. Watch out for the Grunt chain reaction! Friday, July 22, 11:30 a.m. - 12:30 p.m.
Frank O'Connor, Kevin Grace, and others from 343 Industries, as well as special Halo guests Greg Bear and Karen Traviss, discuss the first 10 years of Halo and offer a sneak peek into what's next for this exciting sci-fi universe. You can see the skull in action in the embedded clip below, though if you read the above text, you won't be incredibly surprised by the footage. Of course, it is also a chance to see the newly enhanced remake in action, and one can't deny that it looks far better than the decade-old original. Those explosions could be fun, but I'm most giddy to see that 343 Industries has left the pistol intact. It's just not Halo without a semi-automatic handgun that doubles as the game's most effective sniping platform.